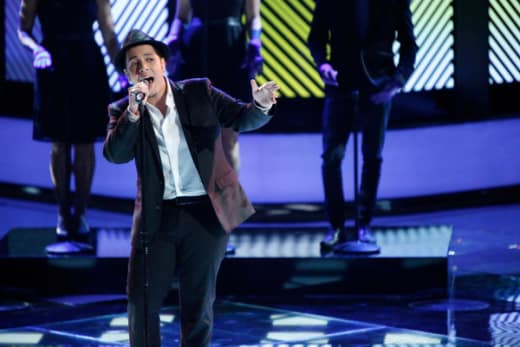 After some seriously controversial eliminations last Thursday, The Voice returned Monday night with the Top 12 singing for their lives. Three contestants from each team performed, knowing that any two of them (regardless of team) could go home on Tuesday. It wasn't that the start sounded terrible, it just was way too bland. To be great you have to hold our interest even in the small moments. When she got into it, it sounded like she might get it going, but then it never seemed to go anywhere great. I loved her new hairdo, though. On the other side of the coin, Dez had me curious from the first note. Whether it was his smooth tone, his ability to entertain, or just his stunning good looks, I was hooked from the jump. He can't do a million things vocally, but as long as he keeps it simple, he should be in good shape in this competition. I'm usually a fan of changing up the style on a track, but it really didn't seem to work here. This song was made specifically for someone like Carrie, who has the twang to pull off some of those yelling moments. Without that twang, it felt very forced from Adriana. Then there were other times when she sounded very faint when it could have used more power. Her tone sounded very nice at least. I can't believe Cee Lo got rid of my boy Mackenzie Bourg so that Cody could sing this provincial track. I'm not going to speak ill of Cody tonight, because only Lord Lambert could have done something great with that song. He showed power in his vocal, but I couldn't have been more bored by during that performance. They missed the ball with that song choice. I am a big Amanda Brown fan, but boy was the beginning hard to listen to. It sounded like she was in between places she wanted to be with her vocal. Much of it sounded like a cat was dying somewhere in the vicinity. I hate that, because I wanted it to be great. Hopefully it was just the song choice. What I love about Bryan is that he is so supremely consistent. He's always going to be on key. He's always going to showcase his voice. And he's always going to bring it old school. I really enjoyed this performance. He doesn't have to try too hard, and the ease at which he sang this rendition was very fun to watch. This was like the opposite of the Amanda Brown effect. I haven't been a huge Cassadee fan up to this point (well besides from her alarming good looks), but this really worked for her this week. Whether it was standing up there with the guitar or the rocker vibe to the entire track, Cassadee was on fire tonight. There was very little vibrato, which I liked, and she hit that big note that I didn't think she would. Very good. Trevin just has a superior voice. Like Adam said, it is hard to say much after a performance like that. It's not just because it was very good, it's also because there was nothing all that special about it. It was great, no doubt, but I've seen much more special moments from contestants in the past. This was the best combination of quirkiness and seriously strong vocals that we've seen from Melanie yet. Her emotion poured through, and that put it over the top for her. I can't believe Cee Lo did that to my man Saint Nick. If he had stayed with his original idea of sitting at the piano, it might have been one of those magical moments we see so rarely on these shows. Standing him up, and dressing the whole performance up in Cee Lo's style, brought it back down to earth. Oh, it was still fantastic, as is everything Nick does, highlighted by those low moments, but it could have been even better. I don't think it's very hard to make that song sound good. I think it's a song that is very difficult to make that song sound great. Sylvia did the first one, but not the second. It was a nice performance, but that's about it. There was absolutely nothing wrong with it, but it didn't have me sitting on the edge of my seat either. I hate to say it, because I liked Terry since the first episode of this season, but this performance made it seem like the guy is destined to be the front man of a really good cover band. He keeps doing big rock anthems, and none of them sound any different than the original. Not only that, but he also really missed the beginning of that one bit falsetto note. He's been better than this, and he will be better in the future. If I had all of America's votes I would be sending home Michaela Paige and Adriana Louise. Who do you think should go home on Tuesday night? Who do you predict WILL go home? And which was your favorite performance of the night?